By Allen Fox: Fresh off his 3rd round stoppage of former IBF middleweight champion Sebastian Sylvester last Saturday night, unbeaten Grzegorz Proksa (26-0, 19 KO’s) told fightnews.com that he’s interested in facing WBC Diamond middleweight champion Sergio Martinez next if he’s interested. 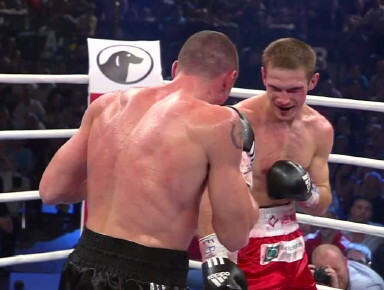 Proksa, 26, claimed the vacant European Boxing Union (EBU) middleweight title with his win over Sylvester. In addition to that, Proksa is now ranked at number #4 by The Ring, ahead of guys like Julio Cesar Chavez Jr., Sebastian Zbik, Dmitriy Pirog, Paul Williams, Hassan N’Dam N’Jikam and Marco Antonio Rubio in the top 10. That’s pretty incredible given that Proksa’s previous 25 fights came against 2nd and 3rd tier opposition. It’s doubtful that Martinez will want to bother facing Proksa, however, as he’s not well known to U.S audiences and there’s no real money in facing him. It would be an interesting fight because Proksa’s fighting style is similar to Martinez’s with his tendency to fight with his hands down. However, Proksa doesn’t appear to have the same kind of power that Martinez has and he’s also not as fast. It would likely be a huge mismatch if Martinez fought him, but it would be a good fight because Proksa has an unbeaten record and he’d make a fight of it with his slick fighting style. This is someone to keep an eye in the future, because he makes it interesting to watch with his showboating. Proksa seems to be cut from the same cloth as Martinez and Dimitry Pirog with his Floyd Mayweather-esque fighting style. But he still hasn’t fought anyone talented enough to really test him, so it’s hard to see how good he is at this point. Sylvester seemed to not even try last Saturday night for some reason.